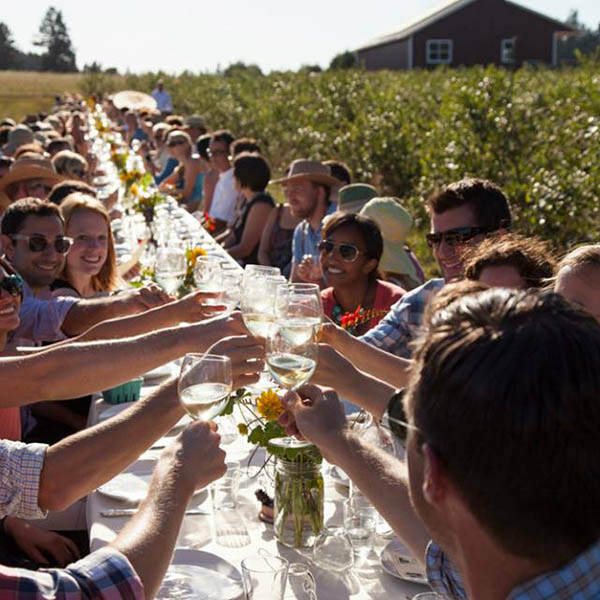 Named to USA Today's 10 Best and Travel+Leisure's Farm Dinners Not To Miss, Our Table in the Field is our on-farm dining series. 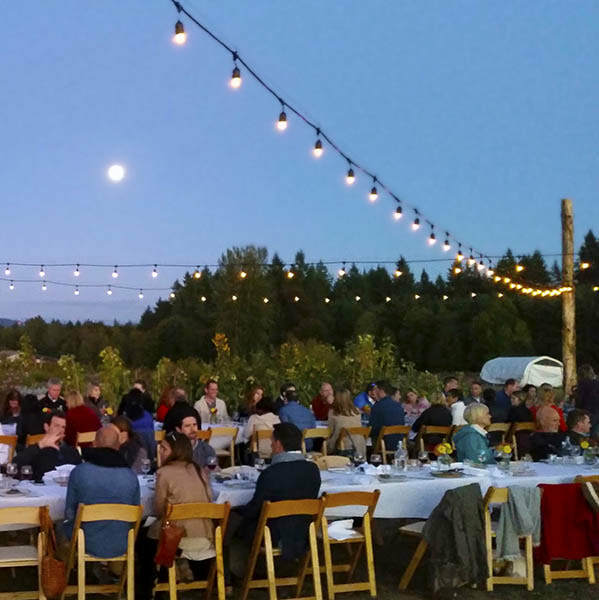 We take pride in making farm dinners events that create lasting memories. Whether partnering with local chefs, or hosted by our own Chef Greg, we create unforgettable meals using the best season has to offer. ​Make new memories this season with us! Tickets include a multi-course meal, farm tour, wine, and gratuity. ​Due to the nature of the event, we cannot cater to dietary requests (although much of the meal is vegetable-based). Co-op members receive a 10% discount. ​Seating requests?​ Email events@ourtable.us to let us know. Guests arrive at the farm and are guided to the reception area, where they mingle and enjoy a welcome beverage and passed appetizers. After about 45 minutes there is an optional guided tour of the Our Table farm. The tour is generally 30 minutes in length. The tour ends at the table where guests enjoy the meal. Dinners are served family style and everyone dines at the table. We do not cater to dietary requests although much of the meal is vegetable based. Because of the structure of the dinner it is not recommended for those with strict restrictions such as vegan diets, medical diets, or severe food allergies but can often be satisfying for those that are vegetarian. Events are held rain or shine. The tables are set in an open field so hats and sunglasses are recommended. Although hot during the day, once the sun sets the farm can be a bit chilly, please bring jackets or a blanket to keep you warm. An email with more details will be sent out two weeks prior to the dinner for those who purchased tickets. No refunds are given. If you cannot attend and we have a waitlist for an event we can often help exchange tickets. There is no assigned seating but we can seat large groups together with sufficient notification. Please send questions or requests to sales@ourtable.us. We look forward to dining in the field with you! Photos by the fantastic Shawn Linehan. Feb 14: Valentine's Dinner with Chef Chef Kerri Cacciata of Our Table. July 28: Chef Sam Smith of Tusk, and Chef Kerri Cacciata of Our Table. Wine by Johan Vineyards. Aug 25: Chef Kyle Christy of Dame, and Chef Kerri Cacciata of Our Table. Wine by Kelley Fox Wines. Sep 15: Chef Jaco Smith of Le Chon, and Chef Kerri Cacciata of Our Table. Wine by Seufert Winery. Oct 20: Diwali Dinner - A collaboration between Our Table founder Narendra Varma, member Jyoti Aneja, and chef Greg Pezeshki. 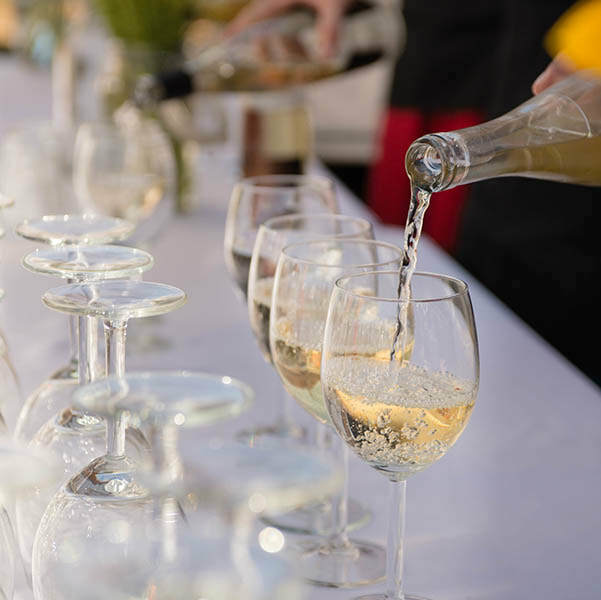 Wines from Beacon Hill Winery & Vineyards​. Aug 5: Chef Joshua McFadden, of Ava Gene's for a celebration of his new cookbook Six Seasons: A New Way with Vegetables. Wine provided by Carabella Vineyard. Oct 19: Diwali Dinner - Chef Sam Smith of Tusk, Kerri Cacciata of Our Table and Narendra Varma of Our Table​. Chef Joshua McFadden with Chef Sam Smith of Tusk and Pastry Chef Nora Antene of Tusk and Beckham Estate Vineyard. We also welcomed Chef Naomi Pomeroy of Beast, Chef Sarah Minnick of Lovelys 50/50, Kristen Murray of Maurice and Chef Bonnie Morales of Kachka. Terra Vina Wines pairing during the summer dinners and Beckham Estate Vineyard pairing during the fall dinner.